Eve was, unfortunately, completely underwhelming. The basic premise actually has the potential to be really interesting. In a future dystopia, girls and boys are isolated and raised separately. The girls are raised in an academy where they are taught that at their 18th birthday, they will move across the river and choose a trade to work in for the rest of their lives. Boys are raised in their own separate work camps. The girls are taught to believe that men are evil (procreation is replaced wholly by artificial insemination), and the only man who is honest and trustworthy is their King. 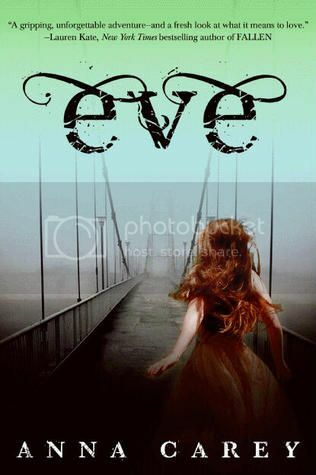 Unfortunately, Eve finds out a terrible secret about the world around her. The girls aren't going where they've been told after their 18th birthdays. They are headed for a much, much darker fate. When Eve discovers this, in just barely enough time to get away, she piggybacks on another girl's escape and tags along to get out while she can. They continue on a strangely paced, and much-too-convenient path that leads them to Caleb, the predictable love interest and boy who will show Eve that boys aren't truly evil. Yawn. Eve's character was frustrating for me. I didn't outright dislike her, but I didn't feel any true sense of connection with her either. She was sort of wishy-washy. Eve suddenly upended her entire world view in about 3 minutes, leaves the school immediately, and doesn't seem to have a whole lot of guilt or inner turmoil about having left behind the rest of the girls she grew up with to their fates. She mentioned it here and there, but overall, I needed her to be much more interested in rescuing the other girls she left behind in order for me to actually like her and not feel that she was shallow and self-serving. Next comes another so-called plot twist involving Eve and the King of the land - and it is completely under-developed and makes virtually no sense. It was a poor attempt to create drama, and it really just fell off the page as superficial and not at all probable. The 'why' and 'how' are never explained, and it just reads like a very obvious plot device to move the story towards the end (and also to serve as a set up for future books, would be my guess). Unfortunately, this ill-built plot twist becomes the main driving force - it is what is supposed to drive the series and really ramp up the reader's adrenaline and pique their interest. Here's the problem - it just didn't work. It was kinda boring, kinda out of nowhere, didn't really make all that much sense, and completely lacked any sort of explanation. The entire book read like a first draft - that's really the best way I can think of to describe it. The skeleton of a great story was there, but the execution was just way off. This book could have been great with a few more critical eyes on it and maybe a little more back story and explanations as to why the world has gotten to the why it has (and also what the future plan is?). I was expecting to love this series, but unfortunately, I don't feel very excited about continuing on with it. I will likely read the next book in the series, since I already own it, and hope that the writing and world-building have been better developed in the coming installments. Fingers crossed!